One of my goals for this year is to try to join more challenges and see what comes of it. I think sometimes I get stuck in a rut and this might be a way to unstick myself. Plus, it's a way to use all of the paper that seems to be taking over my craft room. 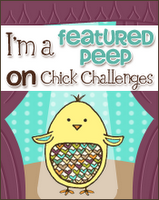 The challenge I'm joining today is from the Moxie Fab World- Map to Your Heart. The paper is from 7 gypsies and I love this car from Unity. There is so much detail to the paper that I had a hard time trying to balance that without the car becoming lost on the card- so I went totally simple. The sentiment is also Unity, the button is Basic Grey, twine is from Papertrey Ink. I colored a toothpick black for the flagpole. 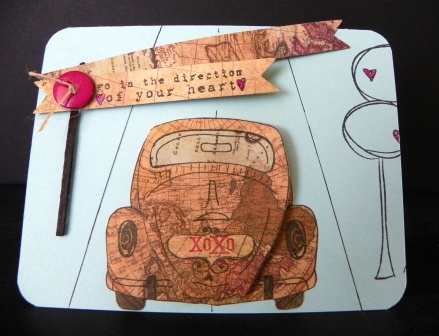 Sarah, LOVE the flagpole and the sentiment with all the hearts on this card! So CUTE! Simple was perfect to make the car stand out! such a fun way to use a map...love that car!